They have Stitch Fix for pregnant ladies! I had JUST had Hayden (baby #2) almost two years ago when Stitch Fix announced they were starting a maternity box. Oh, how I wish I had had it during my first two pregnancies because this was amazing! I’m not exaggerating either. I actually did a little maternity shopping at my local Pea in a Pod with husband and children in tow a few months ago and boy, was that ever stressful! Thankfully it was just our crazy family in the store, but it took 2 hours of shopping and trying things on to finally find things that worked…all while chasing the kids around. Then, $400 later…I had a few outfits to show for it. However, with this maternity box, I couldn’t be happier. Not only was it less costly than shopping at brick and mortar stores, but it took me all of 2 minutes to schedule the box and 5 minutes to make sure all the clothes fit and I liked them. Which I did! I made sure to tell the stylist that I was working on a capsule wardrobe and that I wore a lot of neutral colors. I can wear all of the clothing together and make them into different outfits. Plus, all of the clothes go with the other neutral clothes I have, making countless outfit possibilities…which you need when you’re pregnant! Before we get to the clothes, if you haven’t heard of Stitch Fix before, it’s an online service where you fill out a style profile, pay $20 to have a stylist pick out clothing, accessories or shoes for you and send them to you. Once you receive them, try them on and you have three days to choose which ones you’ll keep and which ones you’ll return (package and shipping already included). If you keep any of them, that $20 styling fee goes towards your final purchase. 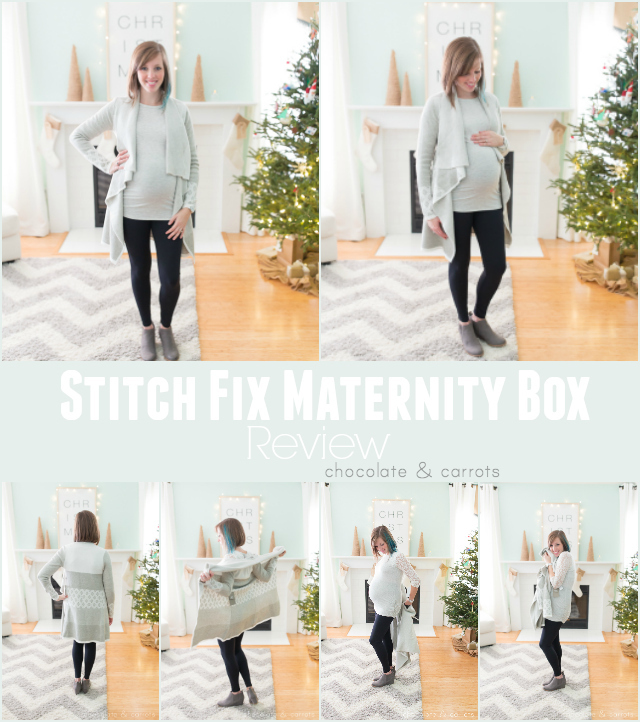 Want to see what I got in my first maternity Stitch Fix box? Evolution by Cyrus Chiana Graphic Open Drape Cardigan – $88 –The softest thing I’ve ever put on my body. It’s seriously soft. My sister felt it and said it felt like cashmere. I’ll take it! Added bonus…the kids like to cuddle big time when I’m wearing it just to feel it. 2. Madigan Bynum Lace Front Yoke Maternity Knit Top – $54 – I love the black with the subtle lace on the top. It’s modest, yet shows off the ever growing bump. It’s also really soft material and is quite comfortable (my two most important parts of clothing lately). 3. 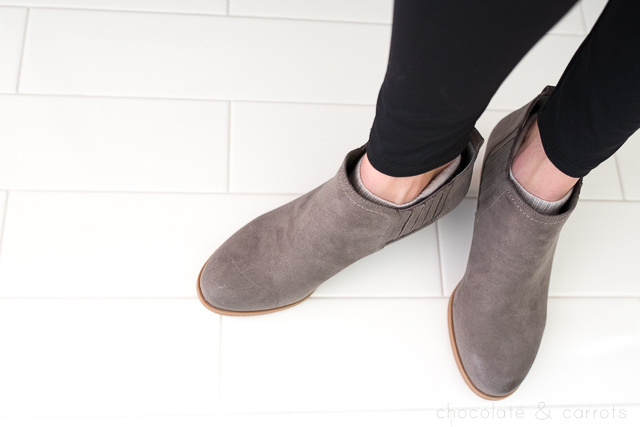 DVB Bria Wedge Bootie – $80 – This is the first time I’ve ever gotten shoes in a Stitch Fix! I was actually just telling my husband the other day that I was in serious need of shoes. I was down to one pair of flats that I bought from Target (you know, the ones you have to replace every 4 months because you wear them down so much!) and a pair of boots that the bottoms had completely worn off because I’ve had them for so long. When these came and I tried them on, they were perfect! Perfect size and I can literally slip my feet into them without ever having to bend down. Yep, we’re at the stage in the pregnancy already. 4. Loveappella Maternity Agnes Lace Sleeve Maternity Knit Top– $54 – This is such a fun top with the side lace. It’s also very comfortable, but still elegant. I know what I’ll be wearing for Christmas! 5. Rune Porter Matenity Legging – $58 – Lastly, the leggings you’ve seen in every photo so far. I have a few pair of Blanqi leggings that I love, but these are lovely, too. They aren’t supportive leggings like the Blanqi, but they are very comfortable. I wore them on our babymoon and felt like there wasn’t as much pressure on my stomach after eating delicious meals as I usually do with the supportive Blanqi leggings. I could relax my belly and eat until my heart’s content. Overall, it was a merchandise total of $334, but with the 25% discount for purchasing all five pieces and the $20 styling fee credit, I bought the entire box for $230.50. Pretty sweet deal for never having to set foot in a store with kids in tow! As an added bonus, it’s right before Christmas, so I’ll have ample time to wear these outfits, as well as being able to dress them up for the holidays ahead! If you want to sign up or get the men in your life to try Stitch Fix for themselves, click here. This is not a sponsored post. I purchased the Stitch Fix box by myself. This post does contain referral links for new sign-ups that gives me a small credit towards my next box because you want to make me and my husband more fashion forward, right?